Massanutten Village was planned in the late 1960s and development began in 1971. It was designed primarily as a second home resort-type community within the Rockingham County Zoning Ordinance of 1969. 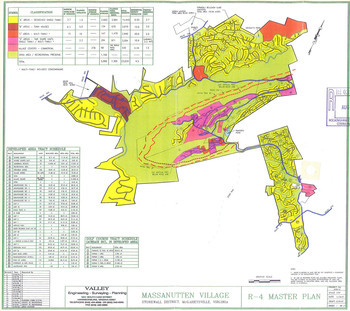 Specifically, Massanutten Village was designed to meet the Residential Planned Community (R-4) District of the Ordinance requiring the project to have a minimum area of 3,000 acres, a minimum of 25% open space, and a maximum housing density of five (5) units per gross acre. The District also required a «variety of housing accommodations in an orderly relationship to one another». 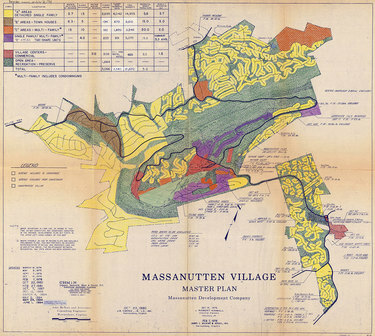 The first Massanutten Village Master Plan (dated August 1971) was approved by the County Supervisors and is shown below on the left. It delineated a project area of roughly 3,000 acres with approximately 5,000 dwelling units for an estimated 15,000 residents. It is interesting to point out that the 5,000 dwelling units alone in first Massanutten Village Master Plan would take 25 years to complete under a very optimistic home construction average of 200 units built per year. Under a more realistic (yet still optimistic) home construction average of 100 units built per year, the entire project would take at least 50 years to complete. 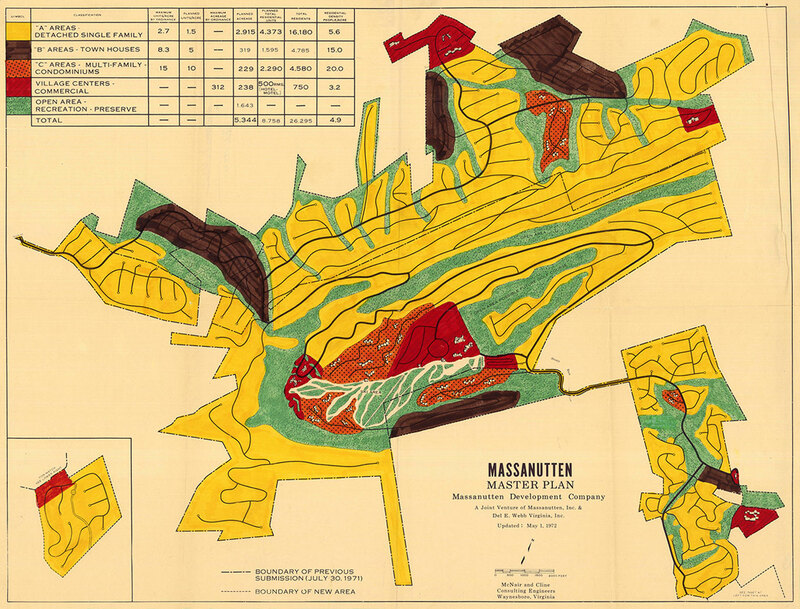 Upon the approval of the first Master Plan in 1971 by Rockingham County, Massanutten Village was going to be a very long term commitment that would result in areas of the project being sparsely populated for many years as the project matured. The second approved Massanutten Village Master Plan was dated less than a year later (July 1972) and shown above on the right. The second plan amended the project area to more than 5,000 acres with more than 8,000 dwelling units for more than 25,000 residents. A careful comparison of the two plans (shown side-by-side above) reveals the increase in area from 3,000 to 5,000 acres is largely due to land added to the northwestern area of the project. It should be noted that today this additional area remains relatively untouched even 40 years later. It should also be noted that the increase in dwelling units from 5,000 to 8,000 extended the development timelines to more than 80 years. Since the 1972 Master Plan, there have been a total of ten (10) more amendments to the Massanutten Village Master Plan. All of the amendments maintained approximately the same project boundaries, size, number of units, and estimated population. The most significant amendment to the Massanutten Village Master Plan came in 1994 and shown in the map below on the left. This amendment included the introduction of timeshare units to the types of housing units in Massanutten Village. The subsequent and the most recent amendment to the Master Plan was made in 2002 and shown in the map below on the right. The 2002 amendment was relatively straight forward just adding 104 timeshare units to the project in three (3) new areas in the Kettle, while eliminating some proposed timeshare units in existing areas. The table below compares the four (4) Master Plans discussed and shown above along with the developed areas of today. 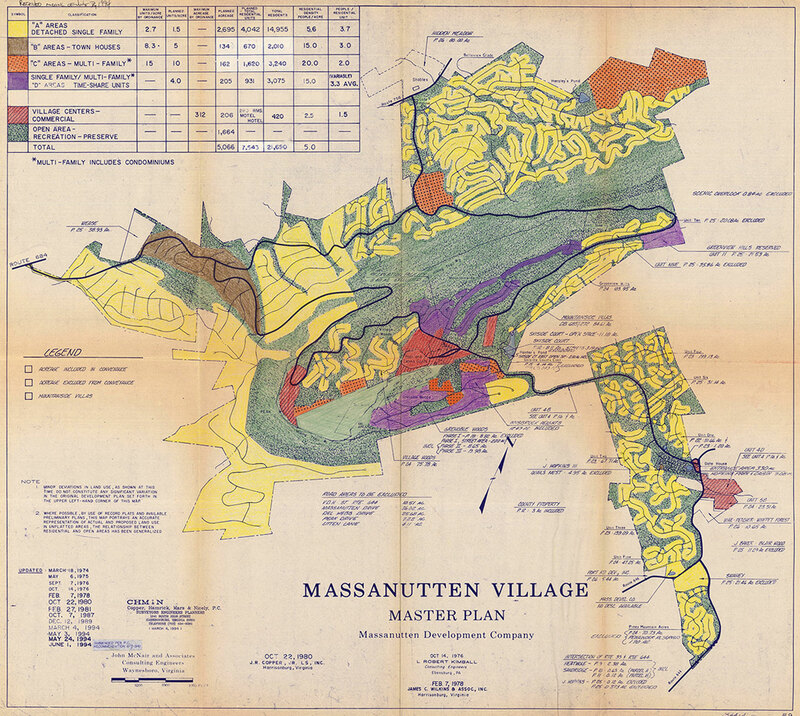 All of Massanutten Village should be included within the boundaries of an incorporated town of Massanutten. 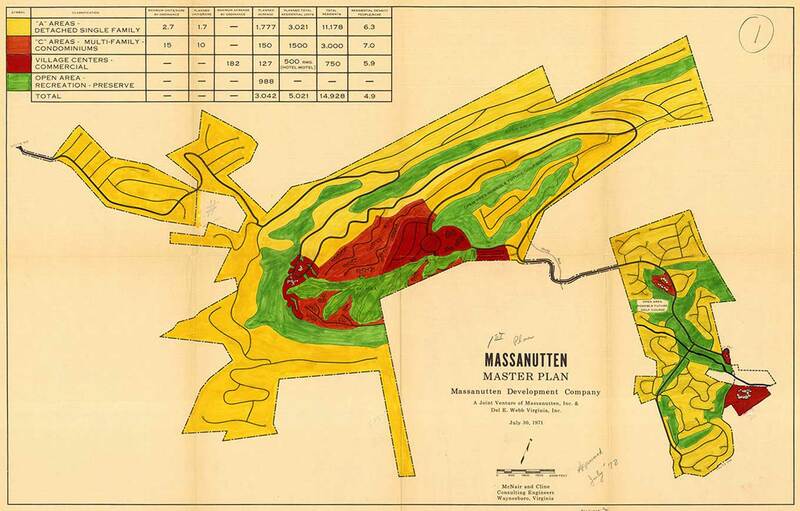 Although the total land area could be considered to be sparsely populated, that is because the more than 2,000 acres were added in 1972 to the original Massanutten Village Master Plan remains largely undeveloped today. These 2,000 acres have been part of the Master Plan as it still exists today (40 years later).